A Quick Way to Find Your Next Job! Looking for a new job? JobFinder will find it. With JobFinder searching for a job doesn’t need to be complicated or time consuming. Simply customize your search and JobFinder will scan thousands of the best employment sites and job boards: Career Builder, Monster, Hot Jobs, Net Temps, Dice Computer Jobs and many many more. JobFinder reduces your job search from days to minutes. With one click JobFinder searches thousands of job sites millions of jobs classified ads and company web sites and then presents matches in one easy-to-manage dashboard. You can store resumes and quickly reply to any job opening. Even better JobFinder always keeps searching for your job – even when you’re away from your computer - and immediately sends a notification whenever new jobs arrive. 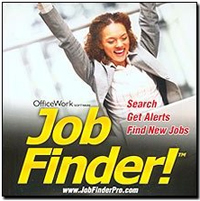 So you’ll always be in touch JobFinder sends notifications of new jobs to your inbox Blackberry iPhone or SmartPhone. Super Powerful Search - Search thousands of websites millions of jobs at once. One Dashboard - Manage all job search results in one easy dashboard, Quick Reply - Reply quickly with cover letters and resumes, Note Tags - Keep track of your submissions with note tags. Instant Alerts - Receive instant notification of any new job match.